Myanmar has recently opened its doors to the world after decades of isolation and now is the time to explore these distinctly different regions of this fascinating country. We have created this unique itinerary which is perfect for the first time visitor to Myanmar. This itinerary gives the traveler fascinating access into highlights of the country. With a focus on the culture, people, arts and sights of Myanmar, you will see fairy-tale pagodas, fascinating architecture and lively street life. You will stay at deluxe boutique hotels and dine on gourmet cuisine. Our guides are carefully chosen for their wealth of knowledge and their ability to help understand Myanmar’s diverse cultures and sights. The warmth and hospitality of the local people will make this journey memorable. Myanmar has recently opened its doors to the world after decades of isolation and now is the time to explore these distinctly different regions. This Myanmar photography trip takes you to one of the most mysterious and undiscovered destinations in the world. Exotic Myanmar. . . the splendor of Old Asia, seemingly untouched by time. 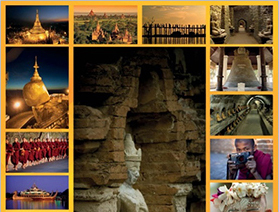 . . the magic of Mandalay, the magnificent temples of Bagan . . . This trip will be accompanied by Dr. Donald Stadtner, a well-known figure in the field of Burmese Arts, History and Archaeology.